This is the opportunity for me to introduce Classification of ellipsoids by shape and surface gravity, by Anthony Dobrovolskis. With very accurate calculations, the author classifies these bodies, following their shape, the reason why they are ellipsoids, and the possible behavior of their surface. This study has recently been published in Icarus. First, what is an ellipsoid? Well, this is a volume, which boundary is characterized by three lengths. Each of these lengths gives the maximal distance between two points of the surface of the ellipsoid in a given direction. This may seem fairly abstract, doesn’t it? Well, you know what a ball is. It is a kind of 3-dimensional circle. The ball has a center, with which every point of the surface has the same distance. This distance is the radius, and twice the radius is the diameter, which is also the maximal distance between two points of the surface of the ball. Now, imagine a rugby ball, or an US football ball. You see what I mean? Yes, you’ve got something closer to an ellipsoid. And why speaking of an ellipsoid? Well, as usual in science, this is an approximate model, which permits to render things pretty well. When you look at a celestial body in the sky, you see a dot. Degree 0 approximation. Now, if you look closer, you see a ball. Degree 1 approximation. And if you want to be more accurate, then you make a degree 2 approximation, i.e. an ellipsoid. Sometimes, we cannot do better. Well, only sometimes. For instance, we can go further than the order 100 for the Earth or the Moon. 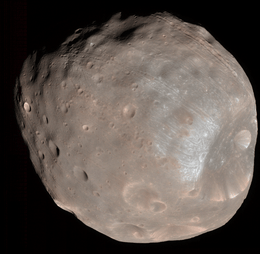 We also know the shape of Mars with a very good accuracy. We also dispose of accurate shape models of asteroids. In many cases, there is a physical justification for a degree 2 approximation of the shape. I mean, physics shape many objects, especially when they are large enough (some 200 km) to be in hydrostatic equilibrium. Let us see that now. Imagine a ball of fluid. This is like a ball. Like a star, like the Sun. Now, if this bowl has a significant rotation about one axis (which is anyway the case for stars), then it flattens at its poles. This is particularly obvious for the gas giants, i.e. Jupiter, Saturn, Uranus and Neptune, but actually for any planet. Even our Earth. The mean equatorial radius of the Earth is 6,378.1 km, while its polar radius is 6,356.8 km. And now, imagine a planetary satellite, like our Moon, but what I will tell you also holds for most of the satellites of the gas giants (well-known example: Saturn’s Titan). The satellites rotate synchronously, i.e. their orbital period is exactly the same as their spin period. As a consequence, they always show the same face to their parent body. In doing so, the same point of the surface is always closer to the parent planet, and is affected by a stronger gravitational perturbation, which tends to elongate the satellite. You have now a triaxiality! What we call hydrostatic equilibrium is a balance between the self gravity of the body and the torques affecting its shape, i.e. rotation and tides, when applicable. Tides can be neglected for most of the planets. Mercury is a notable exception among them, since it is the closest to the Sun, and it is locked in a spin-orbit resonance. Contrary to the planetary satellites, this is not the 1:1 synchronous resonance, but the 3:2 one. In other words, the orbital period of Mercury is 88 days, while its rotational one is two thirds of it, i.e. some 58 days. And it can be shown, with equations of course, that this state generates a triaxiality, which is anyway smaller than the one raised by the synchronicity. in the structure. But, this does not work that bad. And what about smaller bodies? Well, for smaller bodies, the hydrostatic equilibrium does not help you. So, you may have different kinds of shape, mostly irregular (I like calling them potatoidal). Usually, their shape is primordial, i.e. no process affected it since the formation of the body (from accretion or collision… possibly both). The ellipsoidal approximation can anyway give interesting results, in the sense that it can even model a cigar-like body. You just have to consider that two axes have a very small ratio. A well-known example is the interstellar interloper 1I/’Oumuamua, which visited our Solar System in October 2017, on an eccentric orbit, suggesting it was formed around another star. 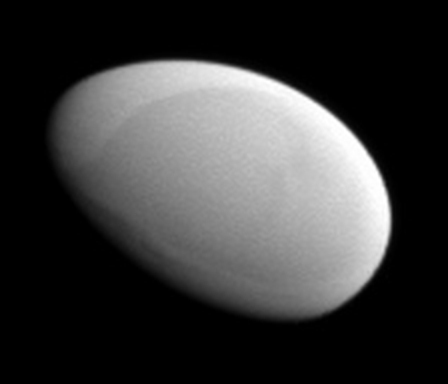 That body was not directly imaged, but observed variations of its albedo are consistent with a cigar-like shape. After very rigorous analytical calculations, the author classifies free rotators (i.e., not affected by tides) into three classes, and classifies 99 asteroids, which shapes are known. These classes are delimited following the shape index ζ=(1-c/b)/(b/a), where a > b > c are the three radii of the asteroid. the three previous ones, and the new class of the ultra-low-brow moonlets. You can wonder: why doing that? Well, it could tell us something on the formation of our Solar System, in permitting statistics on the existing bodies. If we encounter another system (and we now know that there are many extrasolar systems), and if we have one day enough data to perform those statistics, any discrepancy, or absence of discrepancy, with the statistics of the Solar System will tell us something on our differences. and the webpage of Anthony R. Dobrovolskis.